What Are Signs and Symptoms of Arthritis? What Are Arthritis Risk Factors? When Should Someone Seek Medical Care for Arthritis? What Questions Should Someone With Arthritis Ask Their Doctor? What Exams and Tests Do Doctors Use to Diagnose Arthritis? What Are Arthritis Treatment Options? What Are Arthritis Home Remedies? Does One's Diet Affect Arthritis? What Are Medical Treatments for Arthritis? What Types of Surgery Treat Arthritis? What Other Forms of Therapy Treat Arthritis? How Often Is Medical Follow-up Needed After Initial Arthritis Treatment? Are There Ways to Prevent Arthritis? What Is the Prognosis for Arthritis? How Can Someone Find Arthritis Support Groups and Counseling? Arthritis is a joint disorder featuring inflammation. A joint is an area of the body where two bones meet. A joint functions to allow movement of the body parts it connects. Arthritis literally means inflammation of one or more joints. Arthritis is frequently accompanied by joint pain. Joint pain is referred to as arthralgia. Arthritis is classified as one of the rheumatic diseases. These are conditions that are different individual illnesses, with differing features, treatments, complications, and prognosis. They are similar in that they have a tendency to affect the joints, muscles, ligaments, cartilage, and tendons, and many have the potential to affect internal body areas as well. There are many forms of arthritis (over 100 have been described so far, and the number is growing). The forms range from those related to wear and tear of cartilage (such as osteoarthritis) to those associated with inflammation as a result of an overactive immune system (such as rheumatoid arthritis). Together, the many forms of arthritis make up the most common chronic illness in the United States. Arthritis sufferers include men and women, children and adults. More than half of those with arthritis are under 65 years of age. A majority of Americans with arthritis are women. Symptoms of arthritis include limited function and pain in the joints. Inflammation of the joints from arthritis is characterized by joint stiffness, swelling, redness, and warmth. Tenderness of the inflamed joint can be present. Loss of range of motion and deformity can result. Certain forms of arthritis can also be associated with pain and inflammation of tendons surrounding joints. Arthritis can affect any joint in the body, including the knees, hips, fingers, wrists, ankles, feet, back, and neck. The pain may be intermittent or constant. Some types of arthritis cause acute episodes of symptoms (flare-ups). Some forms of arthritis are more of an annoyance than a serious medical problem. However, millions of people suffer daily with pain and disability from arthritis or its complications. Moreover, many of the forms of arthritis, because they are rheumatic diseases, can cause symptoms affecting various organs of the body that do not directly involve the joints. even symptoms from abnormalities of organs such as the lungs, heart, or kidneys. an overactive immune system (such as rheumatoid arthritis and systemic lupus erythematosus). Treatment programs, when possible, are often directed toward the precise cause of the arthritis. Age: The risk of developing many types of arthritis, including osteoarthritis (the most common type), increases with age. Genetics: Most types of arthritis, including osteoarthritis, rheumatoid arthritis, gout, and ankylosing spondylitis, have a genetic (inherited) component. Gender: Most types of arthritis are more common in females. Some types, such as gout and ankylosing spondylitis, are more common in men. Overweight and obesity: Excess weight predisposes to many types of arthritis due to added wear and tear on the joints. Injuries: Injured joints are more likely to develop osteoarthritis. Infection: Many infections can attack the joints and cause arthritis. Occupation: Occupations involving repetitive movements can predispose to the development of osteoarthritis and other musculoskeletal conditions. Primary care physicians such as internists, family practice doctors, and general practitioners frequently diagnose and treat common musculoskeletal conditions and straightforward cases of arthritis. Rheumatologists are specialists in the more than 100 different types of arthritis and have great expertise in the diagnosis and treatment of arthritis, from straightforward to complex cases. Orthopedists (also known as orthopedic surgeons) commonly treat arthritis, especially when surgical management is necessary. Other medical specialists who may be involved in the treatment of arthritis include physical therapists and occupational therapists. What is my diagnosis? How can I learn more about it? Does my arthritis only affect the joints or are there other areas of my body that can be involved? Can my eyes, heart, lungs, brain, or kidneys be affected? How? What is the likely course of this form of arthritis? What is the long-term outlook? What are my treatment options? What are the risks of not treating at all? How and when should I exercise? I have certain special concerns (for example, fertility, pregnancy, offspring, alternative medicines, surgery, special diets, relatives with tragic outcomes with similar diseases or medications, etc.). How do these particular issues relate to my situation, and how do you feel about them? Are my children likely to be affected by this illness? If so, how can I best help them? While I take the medications that you currently recommend, how should we monitor for possible side effects (for example; examination, blood pressure check, lab testing)? Are you aware of each of the medications that I am taking? The first step in the diagnosis of arthritis is a meeting between the doctor and the patient. The doctor will review the history of symptoms, examine the joints for inflammation and deformity, as well as ask questions about or examine other parts of the body for inflammation or signs of diseases that can affect other body areas. Furthermore, certain blood, urine, joint fluid, and/or x-ray tests might be ordered. The diagnosis will be based on the pattern of symptoms, the distribution of the inflamed joints, and any blood test and x-ray findings. Several visits may be necessary before the doctor can be certain of the diagnosis. Properly guided programs of exercise and rest, medications, physical therapy, and surgery options can idealize long-term outcomes for arthritis patients. An opinion regarding the cause or the type of the arthritis can usually be adequately obtained by consulting a general family doctor. It is often unnecessary to see an arthritis specialist (rheumatologist) for this purpose. However, if the diagnosis or treatment plan is unclear, a rheumatologist might be consulted. A rheumatologist is a medical doctor who specializes in the nonsurgical treatment of rheumatic illnesses, especially arthritis. Rheumatologists have special interests in unexplained rash, fever, arthritis, anemia, weakness, weight loss, fatigue, joint or muscle pain, autoimmune disease, and anorexia. They often serve as consultants, acting like medical detectives at the request of other doctors. Rheumatologists have particular skills in the evaluation of the over 100 forms of arthritis and have special interest in rheumatoid arthritis, spondylitis, psoriatic arthritis, systemic lupus erythematosus, antiphospholipid syndrome, Still's disease, dermatomyositis, Sjögren's syndrome, vasculitis, scleroderma, mixed connective tissue disease, sarcoidosis, Lyme disease, osteomyelitis, osteoarthritis, back pain, gout, pseudogout, relapsing polychondritis, Henoch-Schönlein purpura, serum sickness, reactive arthritis, Kawasaki disease, fibromyalgia, erythromelalgia, Raynaud's disease, growing pains, iritis, osteoporosis, reflex sympathetic dystrophy, and others. When specific organs are affected by disease aside from the joints associated with the arthritis, other medical specialists might be consulted. The treatment of arthritis depends on which particular form of arthritis is present, its location, severity, persistence, and any underlying background medical conditions of the patient. Each treatment program must be customized for the individual patient. Treatment programs can incorporate home remedies, nonprescription and prescription medications, joint injections, and surgical operations. Some treatment programs involve weight reduction and avoiding activities that exert excessive stress on the joint. The goal of treatment of arthritis is to reduce joint pain and inflammation while preventing damage and improving and maintaining joint function. Not every person with arthritis requires medical attention. For example, some patients with osteoarthritis have minimal or no pain and may not need treatment. However, for those with persisting joint symptoms, the ideal steps to take should lead to a proper diagnosis and an optimal long-term treatment plan. This plan must be customized for each person affected, depending on the joints involved and the severity of symptoms. For many patients with arthritis, mild pain relievers such as aspirin and acetaminophen (Tylenol) may be sufficient treatment. Studies have shown that acetaminophen given in adequate doses can often be equally as effective as prescription anti-inflammatory medications in relieving pain in osteoarthritis. Since acetaminophen has fewer gastrointestinal side effects than NSAIDS, especially among elderly patients, acetaminophen is often the preferred initial drug given to patients with osteoarthritis. Pain-relieving creams applied to the skin over the joints can provide relief of minor arthritis pain. Examples include capsaicin, salicin, methyl salicylate, and menthol. Nonsteroidal anti-inflammatory drugs (NSAIDs) are medications that are used to reduce pain as well as inflammation in the joints. Examples of NSAIDs include aspirin (Ecotrin), ibuprofen (Motrin), nabumetone (Relafen), meloxicam (Mobic), diclofenac (Voltaren), celecoxib (Celebrex), piroxicam (Feldene), and naproxen (Naprosyn). It is sometimes possible to use NSAIDs temporarily and then discontinue them for periods of time without recurrent symptoms, thereby decreasing the risk of side effects. This is more often possible with osteoarthritis because the symptoms vary in intensity and can be intermittent. The most common side effects of NSAIDs involve gastrointestinal distress, such as stomach upset, cramping diarrhea, ulcers, and even bleeding. The risk of these and other side effects increases in the elderly. Newer NSAIDs called cox-2 inhibitors have been designed that have less toxicity to the stomach and bowels. Surgery is generally reserved for those patients with arthritis that is particularly severe and unresponsive to the conservative treatments. Surgical procedures can be performed to relieve pain, improve function, and correct deformity. Occasionally, joint tissue is surgically removed for the purpose of biopsy and diagnosis. Doctors who specialize in joint surgery are orthopedic surgeons. Joint surgery using a viewing tube with a cutting instrument is called arthroscopy. Osteotomy is a bone-removal procedure that can help realign some of the deformity in selected patients, usually those with knee disease. Removal of inflamed joint lining tissue is called synovectomy. In some cases, severely degenerated joints are best treated by fusion (arthrodesis) or replacement with an artificial joint (arthroplasty). Patients with arthritis may benefit from conservative measures such as rest, exercise, weight reduction, physical and occupational therapy, and mechanical support devices. These measures are particularly important when large, weight-bearing joints are involved, such as the hips or knees. In fact, even modest weight reduction can help to decrease symptoms of osteoarthritis of the large joints, such as the knees and hips. Medications are used in combination with the physical measures. Resting sore joints decreases stress on the joints, and relieves pain and swelling. Patients are asked to simply decrease the intensity and/or frequency of the activities that consistently cause joint pain. Exercise usually does not aggravate arthritis when performed at levels that do not cause joint pain. Exercise can be helpful in several ways. First, it strengthens the muscular support around the joints. It also prevents the joints from "freezing up" and improves and maintains joint mobility. Finally, it helps with weight reduction and promotes endurance. Applying local heat before and cold packs after exercise can help relieve pain and inflammation. Swimming is particularly suited for patients with osteoarthritis because it allows patients to exercise with minimal impact stress to the joints. Other popular exercises include walking, stationary cycling, and light weight training. Toilet seat raisers and jar grippers can assist daily living. These devices can be helpful in reducing stress on the joints. Occupational therapists can assess daily activities and determine whether additional devices may help patients at work or home. Finger splints can support individual joints of the fingers. Splints are commonly used in the treatment of wrist arthritis. Paraffin wax dips, warm water soaks, and nighttime cotton gloves can help ease hand symptoms. Spine symptoms can improve with a neck collar, lumbar corset, or a firm mattress, depending on what areas are involved. It should be noted that both before and especially after the diagnosis of arthritis, communication with the treating doctor is essential for optimal health. This is important from the standpoint of the doctor, so that he/she can be aware of the vagaries of the patient's symptoms as well as their tolerance to and acceptance of various treatment options. It is also important from the standpoint of patients, so that they can be assured that they have an understanding of the diagnosis and how the condition does and might affect them. It is also crucial for the safest use of medications. Regular follow-up with the health care professional for monitoring can be essential for optimal results and is crucial when medications are taken. People with many forms of arthritis, such as rheumatoid arthritis, can develop certain symptoms that are really warning signs of something occurring in their bodies that is not what the doctor expects to happen. These are signs that can also sometimes represent a significant danger. These "rheumatoid warning signs" are reasons to call the doctor so that they can be interpreted in light of the patient's overall condition. When the doctor who is aware of your condition hears of these symptoms, he/she can determine whether or not they are serious and if any action should be taken immediately or in the near future. Rheumatoid warning signs can represent a worsening or complications of the rheumatoid disease, side effects of medications, or a new illness that is complicating the condition of patients with rheumatoid arthritis. Patients with rheumatoid arthritis should be aware of these rheumatoid warning signs so that they can contact their health care practitioner before their health is jeopardized. Worsening of joint symptoms: This includes more pain, more swelling, additional joint involvement, redness, stiffness, or limitation of function. The doctor will determine whether or not these are significant, not the patient. Sometimes, patients have just begun a medication and some minor increase in joint problems might be occurring while the medication is taking effect. However, worsening symptoms can also mean that the medications are not working and that they require adjustments in dosing or a change in the medications. Lack of improvement of joint symptoms: One major purpose of seeing the doctor is to get better. The doctor knows this. If a patient with rheumatoid arthritis has seen the doctor and is started on a treatment program and is not showing improvement but is worsening, notification of the doctor is appropriate. After starting a new treatment program, it sometimes takes time for the medications, physical therapy, etc., to control the inflammation. It is up to the doctor to decide if things are on course. Fever: A mildly elevated temperature is not unusual in a person with active inflammation from rheumatoid arthritis. However, a true fever (temperature is above 100.4 degrees F or 38 degrees C) is not expected and can represent an infection. People with rheumatoid arthritis are at increased risk for infection because of their disease and frequently because of their medications. Many of the medications used to treat rheumatoid disease suppress the immune system of the body that is responsible for defending against infectious microbes. Furthermore, these medications can increase the risk of a more serious infection when a bacterium or virus strikes. It is important for people with rheumatoid arthritis to notify the doctor as soon as a fever occurs so that infections are treated at the earliest time possible. This can minimize the chances for many serious complications of infections. Numbness or tingling: When a joint swells, it can pinch the nerves of sensation that pass next to it. If the swelling irritates the nerve, either because of the inflammation or simply because of pressure, the nerve can send sensations of pain, numbness, and/or tingling to the brain. This is called nerve entrapment. Nerve entrapment most frequently occurs at the wrist (carpal tunnel syndrome) and elbow (ulnar nerve entrapment). It is important to have nerve entrapment treated early for best results. A rare form of nerve disease in patients with rheumatoid arthritis that causes numbness and/or tingling is neuropathy. Neuropathy is nerve damage that in people with rheumatoid arthritis can result from inflammation of blood vessels (vasculitis). Vasculitis is not common, but it is very dangerous. Therefore, it is important to notify the doctor if numbness and/or tingling occurs. Rash: Rashes can occur for many reasons in anybody. However, in people with rheumatoid arthritis, the medications or, rarely, the disease itself can cause rashes. Medications used in the treatment of arthritis that commonly cause rashes as side effects include gold (Solganal, Myochrysine), methotrexate, leflunomide (Arava), and hydroxychloroquine (Plaquenil). 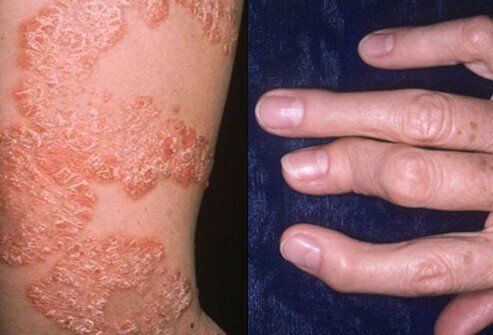 A rare, and serious, complication of rheumatoid arthritis is inflammation of blood vessels (vasculitis), which can cause rash that most commonly appears in the fingertips, toes, or legs. Eye redness: Redness of the eyes can represent an infection of the eyes, which is more common in people with rheumatoid arthritis because of dryness of the eyes (Sjögren's syndrome). Redness can also result from blood vessel inflammation (vasculitis), especially when pain is present. Vision loss of red/green color distinction: A rare complication of the commonly used rheumatoid arthritis drug hydroxychloroquine is an injury to the retina (the light-sensing portion of the back of the eye). The earliest sign of retinal changes from hydroxychloroquine is a decreased ability to distinguish between red and green colors. This occurs because the vision area of the retina that is first affected by the drug normally detects these colors. People who are taking hydroxychloroquine who lose red/green color distinction should stop the drug and contact their doctor. Minimizing emotional stress can help improve the overall health of the patient with arthritis. Support and extracurricular groups afford patients time to discuss their problems with others and learn more about their illness. The Arthritis Foundation is the only national voluntary health organization whose purpose is directed solely to all forms of arthritis. The Arthritis Foundation has national and international programs involving support for scientific research, public information and education for affected patients and their families, training of specialists, public awareness, and local community assistance. Local branch chapters of the Arthritis Foundation serve to disseminate information about arthritis and rheumatic diseases as well as functioning as referral centers. Moreover, many of the various forms of arthritis have their own foundations that serve as information and referral resources for local communities. Patients and families should ask their health care practitioners for additional local support group and counseling options. United States. Centers for Disease Control and Prevention. "Arthritis." Dec. 1, 2016. <https://www.cdc.gov/arthritis/index.htm>. Venables, P.J.W., and Ravinder N. Maini. "Clinical manifestations of rheumatoid arthritis." UpToDate.com. Updated Aug. 2, 2016. What kinds of treatments have been effective for your arthritis? What symptoms did you experience with your arthritis? Please share your experience with arthritis. What have you done to prevent arthritis?